Some day, everything a spirits, wine, catering, event or food salesperson needs to know will be in one place, easily found on their computer, tablet or smartphone. But until that time, brand owners, and particularly smaller and craft brand owners fighting for share of mind, will continue to need to take matters into their own hands. How does that work? And who specializes in these types of solutions for spirits, wine and beer brand owners? We do. We specialize in creating eye-catching, impactful and informative virtual product guides that can be customized for both large screen and small screen sharing among members of the trade and consumer enthusiasts. Imagine the ease of arming your distributors with a simple, email-friendly product guide – or one that can be attached to social media. 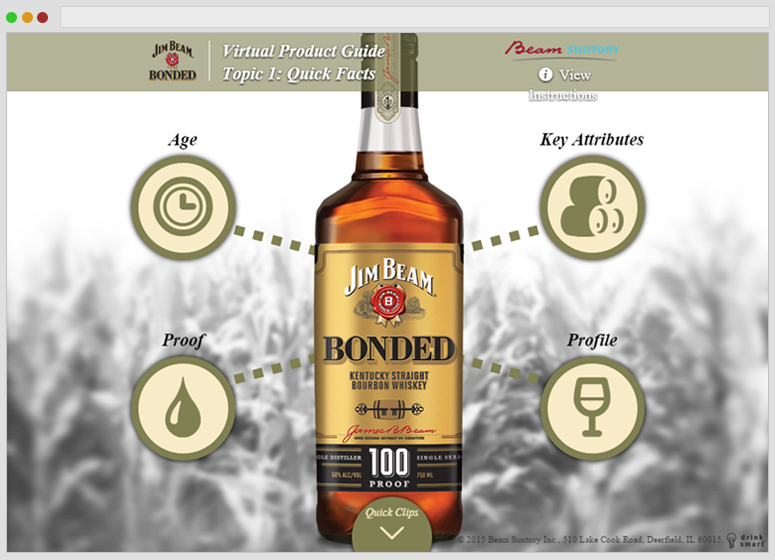 In this example, you’ll see the way one spirits company chose to do it. A variety of facts, in a variety of formats, easy to navigate and engage. All in one page, including interactive elements, videos and even a learning exercise or game. Think of the similar needs of your sales teams and give us a call to put together a prototype or flow chart based on your brand.